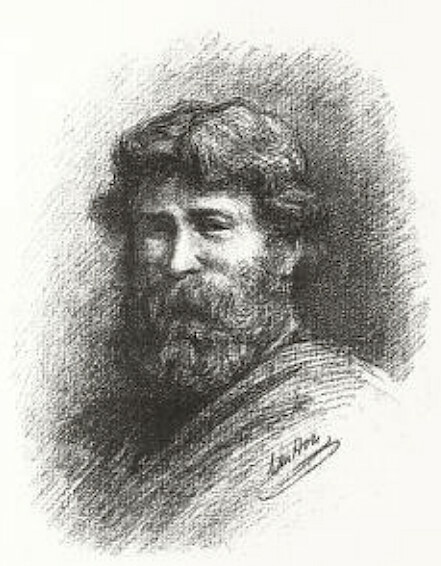 Daniel Cottier. Source: Collection Cottier, frontispiece. Despite having made a name for himself in London at the turn of the 1860s/70s, the Scottish stained-glass craftsman and designer Daniel Cottier (1837-1891) is now better remembered in Scotland and America than he is in England — although even in Scotland his reputation was not enough to save his work on the interior of Townhead Church, Glasgow, which was demolished as recently as 1997. Born in Glasgow, Cottier was the son of a Manx sailor and a Scottish mother. He could hardly have had a better training in his craft. First apprenticed to David Kier (1802-1864), master glazier to Glasgow Cathedral in the early 1850s, he moved on to the important stained glass firm of John Cairney & Co., and then spent some time working with James Ballantine (1807/8–1877), a key figure in the stained glass revival of this period (see Galbraith 19). By the end of the decade he was in London, working for the well-known firm of Ward and Hughes, and taking classes at the Working Men's College when it was still in Red Lion Square, Holborn. This was where he came under the influence of John Ruskin, William Morris and the PreRaphaelites, especially Rossetti and Ford Madox Brown. Having returned to Scotland, he worked in Dunfermline before becoming chief designer for Messrs Field & Allan of Leith in 1862. But he soon set up on his own at 40 George Street, Edinburgh (see Donnolly 8). 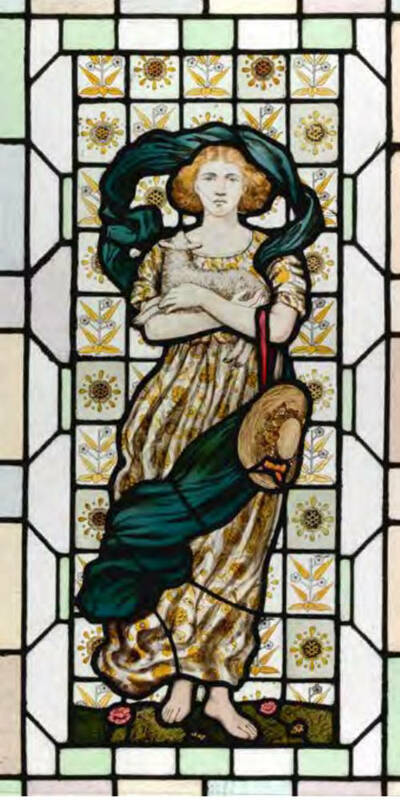 At the end of 1865 he took Stephen Adam, another important Scottish stained-glass designer, into his workshop, and in 1867 he sent "a magnificent ornamental window, in the renaissance style" to the Paris Exhibition: "in the centre, arms on a fanciful shield; splendid design; ornament free and graceful; well-proportioned columns, with a richly-decorated pediment at top, surrounded with cupids; superb harmony of colours.... in my estimation ... the finest ornamental window in the Exhibition," reported a visitor, bowled over by the prize-winning exhibit (Reports of Artisans, 81-82). Some of Cottier's most important commissions at this time were for Alexander "Greek" Thomson's Holmwood House in Cathcart (built in the later 1850s), and three Glasgow churches: J. J. Stevenson's Townhead Church (1865-66), mentioned above, but now lost; William Leiper's Dowanhill church (also 1865-66), where conservation work has been going on for about two decades now; and, for Thomson again, Queen’s Park United Presbyterian Church, Glasgow (1869), unfortunately destroyed by a bomb in World War II. Cottier's return to London in 1869 has been taken to mark "the beginning of his mature aesthetic style" (Frelinghuysen 178). This was just when Japanese influence was coming in, and making an impact across the board in the decorative arts. Cottier banded together with some gifted fellow-Scotsmen to provide a complete interior design service. These included Dundee-born Bruce James Talbert (1838-1881), Dunfermline-born John McKean Brydon (1840-1901), and the architect William Wallace (who died some time after 1909; not the William Wallace usually included here, but who had died in 1866). "Cottier & Co, Art Furniture Makers, Glass and Tile Painters" operated from a studio at 2 Langham Place (see Donnelly 11). Lionel Gossman's "Stephen Adam: The Early Years and the Glasgow Studio"
"Bruce James Talbert." Dictionary of Scottish Architects. Web. 1 December 2016. Coakley, Franes, ed. "Daniel Cottier — 1838-1891." Manx Notebook. Web. 1 December 2016. Collection Cottier: catalogue of ancient and modern pictures, important works of the French, English and Dutch schools. New York: Durand-Ruel / Edinburgh: Constable, 1892. Internet Archive. Contributed by Harold B. Lee Library, Brigham Young University. Web. 1 December 2016. "Daniel Cottier." Dictionary of Scottish Architects. Web. 1 December 2016. Donnelly, Michael. Glasgow Stained Glass: A Preliminary Study. Glasgow Museums and Art Galleries, 1981, rpt. 1985 (downloaded as a pdf, 1 December 2016). Frelinghuysen, Alice Cooney. "A New Renaissance: Stained Glass in the Aesthetic Period." In In Pursuit of Beauty. By Doreen Bolger Burke et al. New York: Metropolitan Museum of Art, 1986. Internet Archive, from the amrricana collection. 177-97. Web. 1 December 2016. Galbraith, Iain B. "Stained Glass in Scotland: A Perspective." The Church Service Society Record. 14 (2012): 14-24. "John McKean Brydon." Dictionary of Scottish Architects. Web. 1 December 2016. Kinchin, Juliet. "Cottier's in Context: Daniel Cottier, William Leiper and Downahill Church, Glasgow." Downloaded from here from Historic Scotland. Web. 1 December 2016. Nicholson, R. G. H. "Ballantine, James (1807/8–1877), stained-glass artist and writer. "Oxford Dictionary of National Biography. Online ed. Web. 1 December 2016. Reports of artisans selected by a committee appointed by the council of the Society of Arts to visit the Paris Universal exhibition, 1867 by Royal Society of Arts (Great Britain); Exposition universelle de 1867 à Paris. London: Bell, 1867. Internet Archive. Contributed by Robarts Library, University of Toronto. Web. 1 December 2016. "William Wallace." Dictionary of Scottish Architects. Web. 1 December 2016. Williamson, Elizabeth, et al. Glasgow. The Buildings of Scotland series. London: Penguin, 1990.